February 1st, 2011 by Cook, David C.
Though you've written other novels, this series is your first YA. What inspired you to write it? I have 16 and 13-year-old girls and neither of them were ever big readers. I've purchased and borrowed book after book, trying to awaken a love of reading in them. It wasn't until I finally tried TWILIGHT a couple of years ago that my eldest caught on, really understood how a story could capture you, keep you up all night reading, make you think about it all day...I read it with her, to get what her particular fiction bent was--and ever since, we've been reading together, finding books in the YA genre we both love. I'm currently in the middle of ENTWINED and she's in the middle of DELIRIUM. My younger daughter is in the middle of I AM NUMBER FOUR. So we've become the major YA reading household! I love it! *I have a two girls as well, 15 and 12! They are both avid readers like yours, love hearing that! So what led you to write WATERFALL? I like a bit of the paranormal and supernatural, started my writing career in romance, and wrote a big medieval suspense series (that I loved writing), so those were in my background. The River of Time series combines all three elements--two sisters from modern times travel back to the medieval era and fall in love--and fight for their lives and those they love. And since I'm always inspired by family and friends, I wanted to write a YA series for my girls, one that might capture them like these other books had, but be unique. According to them, I accomplished that goal. But then, they're family...you'll have to check it out for yourself. What about the other books in the series? All three books are told from Gabi's (the big sister) point of view, but incorporates a ton of adventure and suspense for both sisters. The publisher understood how voracious YA readers can be with series, and so we have a unique release plan--all three books will be out this year. WATERFALL is out now, CASCADE comes out June 1, and TORRENT on Sept 1. Find Lisa at her website, and Twitter. 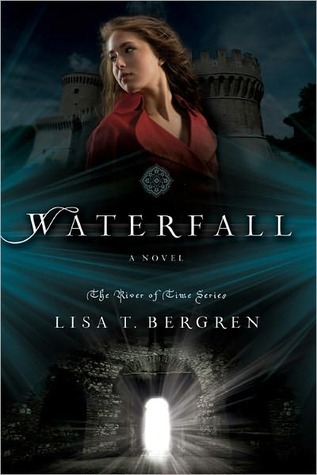 Lisa is kind enough to give one lucky winner a SIGNED copy of WATERFALL!